Sunday December 18 from 3-5 at the Spertus Museum, Chicago. Gabriella Boros will be demonstrating woodblock printing, from concept through cutting the wood, inking and printing. She will have prints from previous projects as well as sketches on view. Ellen Holtzblatt will be presenting new paintings and talking about her process. 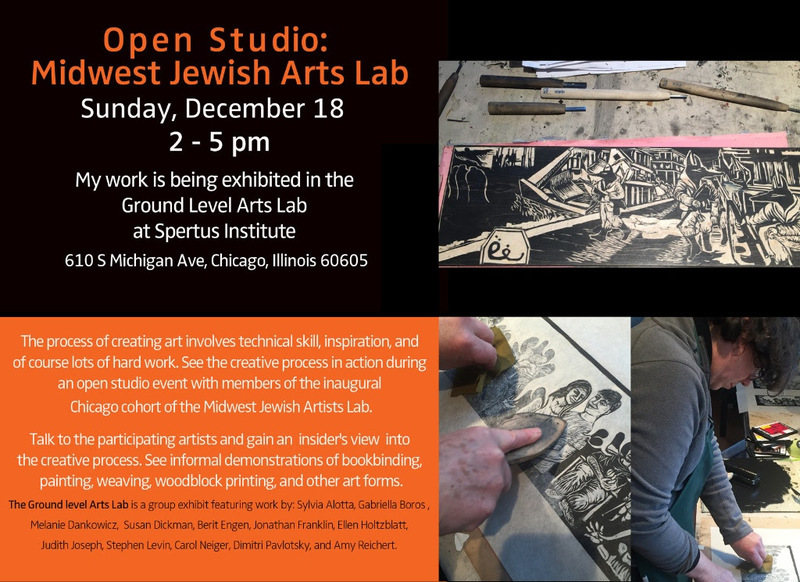 The Ground Level Arts Lab features an exhibition of artworks by the Midwest Jewish Artists Lab, including JAS members Gabriella Boros, Ellen Holtzblatt and Judith Joseph.